Golf can be a very complex game, and as much as it can be fulfilling, it can also be nerve-racking. It is often called the most complex sport there is, sometimes up there with pole vaulting, but in many studies done, it IS the most complex sport there is. Where does that complexity derive from? After all, are we golfers not just taking a nice stroll in the country side on a Sunday afternoon, wearing stuff we would normally leave in the house, here and there hitting at a little white ball? The position you play your ball from depends on the lie of the ball, which club you are playing, what you want to accomplish with the shot, how you want the ball to land, how much spin you want to put on the ball, to name just a few of the elements, influencing this variable. As you may have noticed, or as it may have been pointed out to you by your Pro, your grip can change over time. With different clubs, you can make minute and not so minute changes to how you grip the club, because you see what happens to the ball and try to adapt to it. This is neither positive nor negative by itself, rather these grip changes are just something that can happen. If you play different clubs from different ball positions, in order for the face of the club to be at a right angle to the direction in which you want the ball to go (a square face-to-path relationship), you have to change your hand position in space as compared to the rest of your body. As your clubs go up in length, your set up to the ball, your angles and whole position has to change too, to get the same result each time. 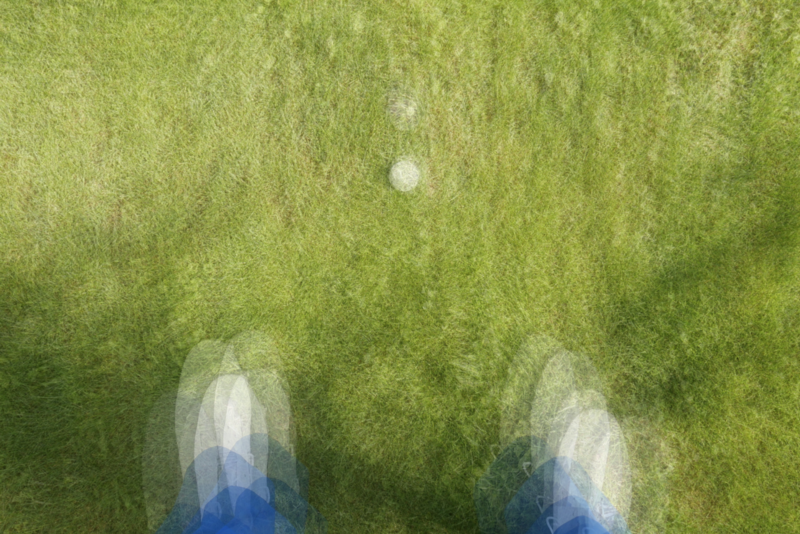 As the length of your clubs goes up and you have to be ever so slightly farther away from the ball, the angle between the ground and the shaft changes, and by it the angle between your hands holding the grip on the shaft, and your lower arms. You stand your legs closer together for shorter shots, and wider for drives, or at least that is what most of us learn when we start out. It makes sense, doesn’t it, if you take into consideration that most golfers go slow and methodically like a surgeon with their wedges, and swing their drivers like a butcher, i.e. at the same time changing their swing speed too. With that comes a change in the angle between the ground and your spine- you stand more upright the longer the club gets. All that makes our beloved game very difficult. Now, here is how same length irons can help you change all that. 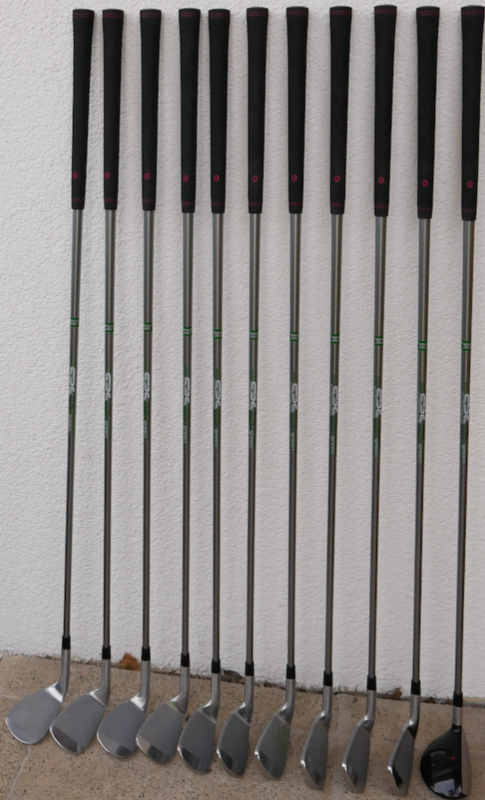 For example, lets compare the differences in playing a set of 9 “normal” length clubs to 9 same length clubs. To make it realistic, lets look at LW, GW, SW, PW, 9i, 8i, 7i, 5i, 5 Hybrid. In a normal set, each club would be slightly longer than the one before, starting with the lob wedge and ending with a 5 hybrid. Same length clubs are all the same length. The difference between the two is that with a classic length set, you end up with 9 different ball positions (although slightly more scrunched up than in the picture), one for each club. Even if we are leaving out everything you could do with every single club and ball combination, you still start with a different position for each club, and thus slightly different set up to it. 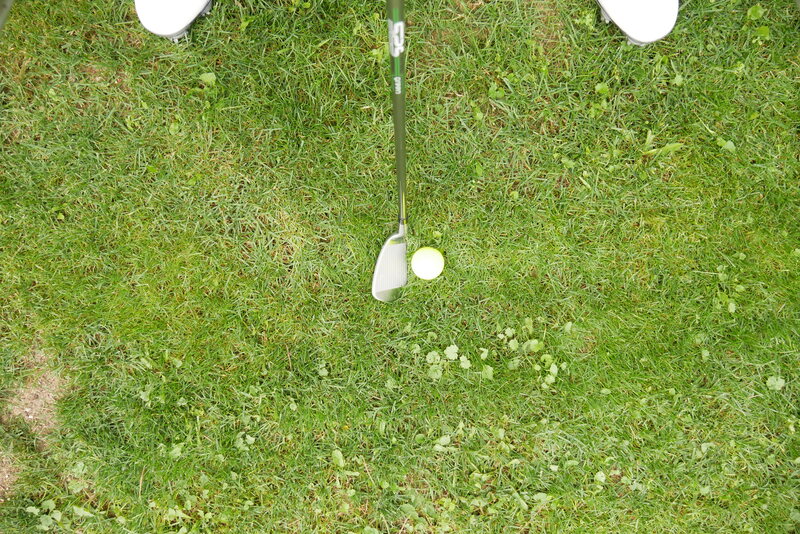 With same length irons, you only ever have to work from one ball position. Be it a 15 yard lob shot, using your LW or a 150 yard hybrid shot down the fairway, using the 5-Hybrid, it will always be the same, central ball position, because same length clubs are all built to the length of a one iron. Because you are gripping 9 clubs of different length, you by definition have to grip them slightly differently, in order to get them in the right position for impact, but it gets even worse. If you take a page out of the works of Dave Pelz, you will probably have not just one full swing, but actually a half swing and maybe a 1/3 swing as well, for different situations. With the classic length clubs, this makes it 9 different grips, x3 different swing lengths, taking it to 27 different combinations. 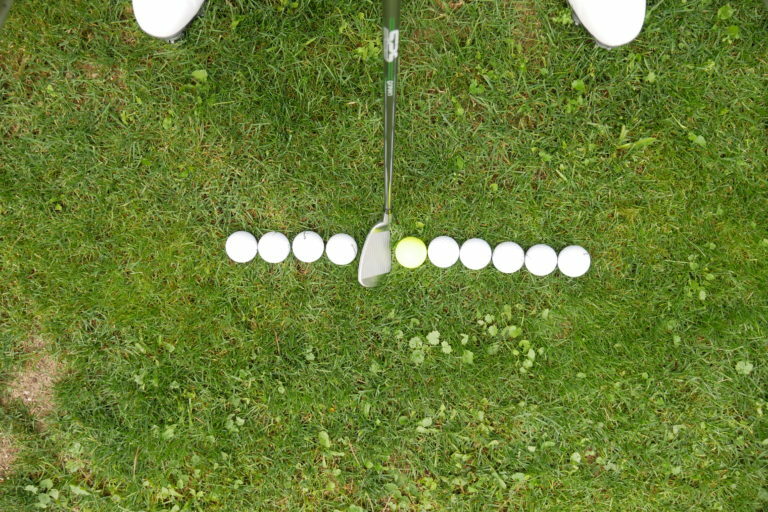 With same length irons, you would at least only have 1×3 combinations to deal with and practice. 9 x 3 = 27 different combinations for classic length, as compared to 1 x 3 with same length clubs. 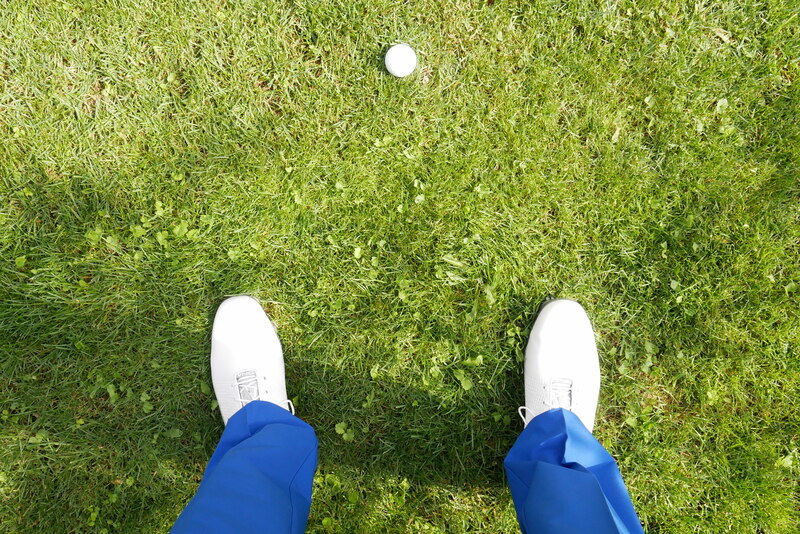 Because of the differences in length with classic length golf clubs, their different lie and sole angles to the ground, you again simply HAVE TO move the position of your hands as compared to your body, in order to get the club face to the ball squarely. If you look at the picture above, we had an average golfer stand in the same place and simply handed him every club one by one, and asked him to set up with it. The resulting pictures we then overlayed on top of each other. Now clearly, everyone has a unique approach to the game, and hand positions will vary. 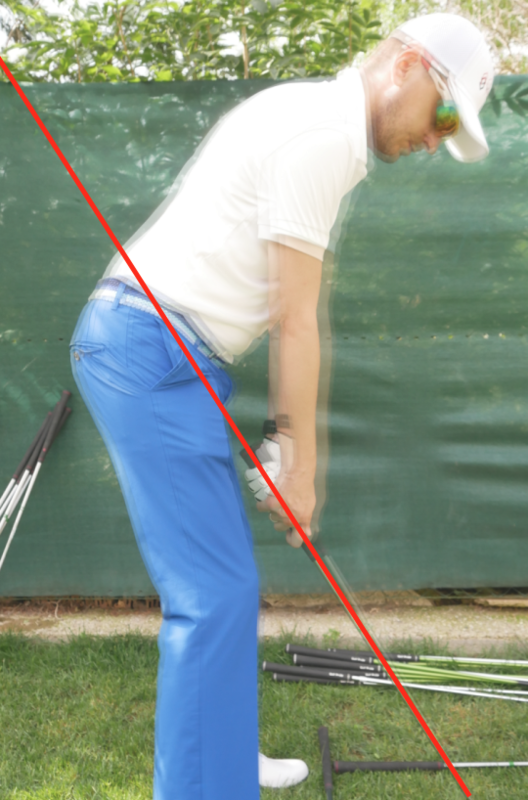 After these pictures, we asked him to set up with the same clubs from a same length clubs set- the resulting overlayed pictures you can find on the right. This forces you to use 9 different hand positions for these 9 clubs, as compared to 1 with same length irons. Obviously, classic length golf clubs are different lengths, and obviously, same length irons are the same length. But what most people do not realize is the difference this will make to your game. Instead of starting the whole set up procedure for each shot anew and from 0, with same length irons, you each and every time, for each and every shot do THE SAME set up procedure, because your clubs do not differ in length. At the same time, while you may be playing the same shafts on all your classic length clubs, you do get ever so slightly varying total club weights as the shafts get longer, differing centers of gravity for each club, as well as differences in how the shafts flex. With the forces working on the shaft during a swing, it will not only bend, and bend a different amount for each length, but also turn on itself (torque). Imagine holding a piece of rubber that is three foot long and 2 inches wide, that is fixed to the ground on one end. Now imagine turning the other end in a clockwise motion- this turning on itself, or flexing, happens to golf clubs during a swing. If the piece of rubber was twice as long, it would be so much easier to turn it, because the material would have that much more length on which to spread the stress. This is why the shorter the club, the less they flex. With classic length clubs, you have a different flex for each club, granted small, but none the less there, and you as the player have to compensate for it. Finally, because they are different in length, not only will the center of gravity be different, but even if your club fitter (and you DID get your clubs fit, didn’t you?) did fit swing weights in the shafts, they will be on an ever so slightly different plane with the different lengths of the shafts, and thus create even more variation. With same length irons, such as the ones legendary club maker Tom Wishon and PGA Professional Jaacob Bowden developed in Sterling Irons, you have only one flex, one identical centre of gravity for all of them, and the same total club weight for all your clubs, which by the way are uniquely fitted to you for the same price as a normal set. 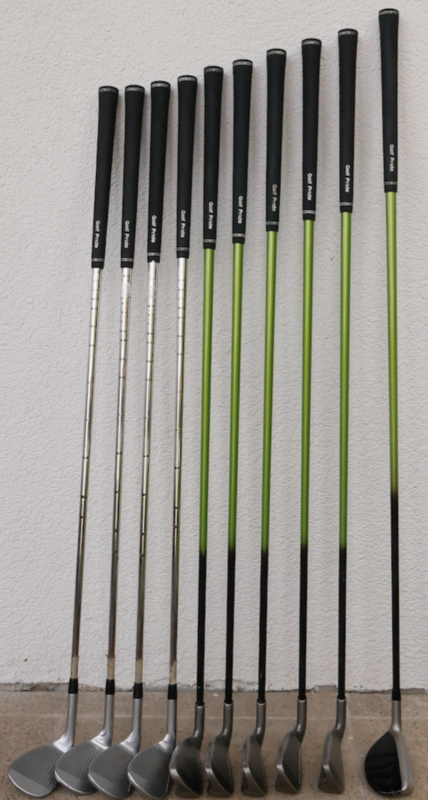 9 different club lengths vs. 1 club length. With the difference in length come differences in stance and the way you hold the club. Because it is so short, you have to bend much more to address the ball with a standard length wedge, than you would with a 5-iron. 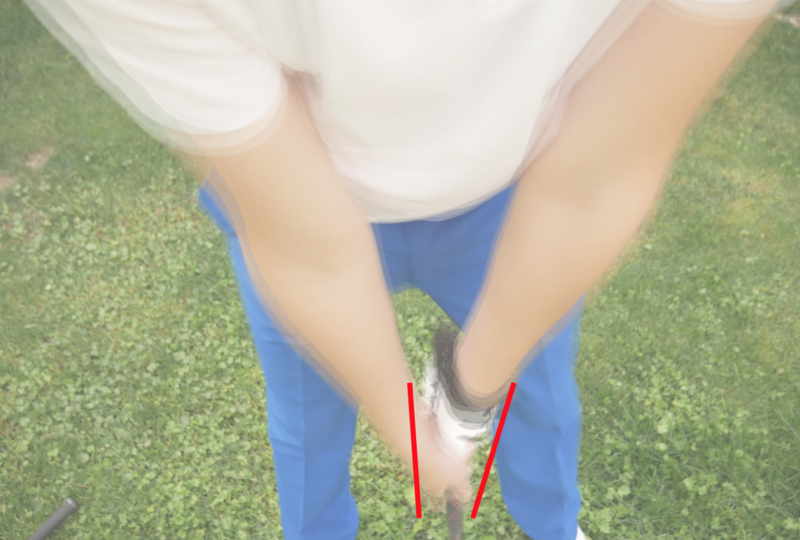 With that comes a difference in the angle between the line the center of the shaft draws through your grip, and the line through your lower arms. We again asked our 20 handicap golfer to set up with all the clubs from a classic length set, but stay in the very same place. We overlayed, and then marked out the highest and the lowest angle as can be seen below. When we did the same with the Sterling Irons(R) Same Length Irons, while there was more than one angle, the difference was a mere degree, and came from him slowly getting tired. Sigh, the youth these days. With classic length clubs, you have 9 different angles to deal with, rather than 1 angle for all clubs. Because the different lengths of classic golf clubs force you farther and farther away from the ball, you have to move your feet out ever so slightly with each longer club, in order to gain the same amount of stability in your set up. We again asked our 20 handicap golfer to set up to the same ball with each club and then removed the club and took a picture. 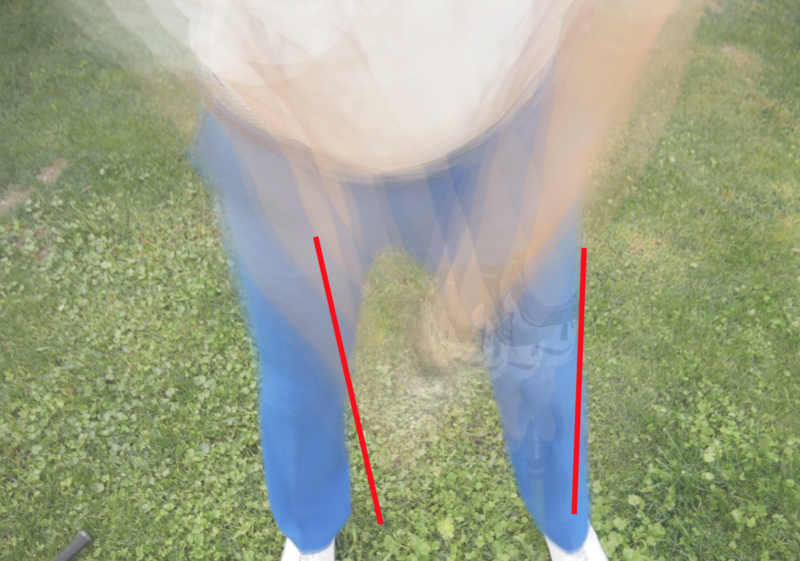 His “blurry” feet are the result of overlaying all these pictures- it is clearly visible that he has as much as 9 different stances for his 9 clubs. Because same length irons are the same length, there is only one distance to the ball with all clubs, and thus, only one stance to get into. As we go through the clubs from low to high, the grip on your club changes, and your hands move from right in your set up to left for the longer clubs (for a right-hander), you also move further away and thus change your spine angle to more and more upright. This has an impact your swing plane. If you think about it, all the above mentioned will force you to level out your swing plane from as you move from high-lofted clubs to low-lofted clubs, swinging each club on a different plane. Biomechanically, it should get easier to swing on one plane the more upright you swing, however because of the differences in stance, weight being swung and speed at which most players swing (the longer the club the faster they swing), this adds a whole dimension of problems to the mix. Naturally, it would be way easier if each swing was on one plane. With Sterling Irons(R) single length clubs, instead of 9 spine angles, you have only one spine angle, and thus, instead of 9 different swing planes, only one swing plane, eliminating the need to practice and remember all those minute differences in order to make your game work. So if you want to remove a hefty 90+ variables from your golf game, switching from different length clubs to single length clubs could be one simple and easy way to accomplish that, without even having to change anything about your swing. We can strongly recommend Sterling Irons (R) Same Length Irons. If you are interested to read more about the concept and why we think they are the best on the market, please click the link above.